You start scrolling through your email, your Facebook feed, your Twitter feed, and your Instagram – and suddenly you’re feeling it: stress. And it’s not just there. It’s all around you. Maybe not all of the time, but stress does make its way into your home, work, and even volunteer time. 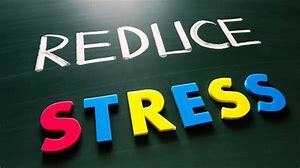 Reducing stress is all the more important. But what are the best ways to do that? Avoid caffeinated drinks, alcohol, and nicotine. These are all stimulants and have an effect of increasing stress. In the case of alcohol, it acts as a stimulant in small quantities and depressant in larger ones. And don’t take in a lot of sugar, either. It’s in a lot of processed foods and can cause your energy level to drop fast. Talk to a friend or family member. Some people say just talking about your feelings helps. And it’s true. That discussion can be a welcome distraction and release at least some of what’s built up for you. You might also gain a new perspective on the thing that’s causing your stress. Say ‘no” sometimes. Let’s face it – you can’t be all things to all people. Sometimes you just don’t have the time or the energy for a new task or project. You can always suggest someone else take it on or at least say you will have to break it up into small pieces to do over time. Get out! Walking or exercising can take the stress away because it reduces a large number of stress hormones that can build up, like adrenaline. Write it down. Keeping something like a stress diary can do a couple of things: it helps you better understand situations around you, and it helps you see what the triggers are that cause your stress level to rise. In your entry, write the date and time it happens, along with where and what you were doing at the time. You could start to see patterns in those entries. If none of these work, there are lots more from which to choose. Keep searching if you need, but remember that stress shouldn’t be a constant in your life. Time is much too precious to spend it all being stressed out!